We are in the valentine month and within few days the valentine week will start. What else can any girl wish for than the heart shaped stuffs. Yeah, we wish everything to be carved out in heart shape, the cookies, the chocolates balloons and the stuffed hearts. Isn’t it? 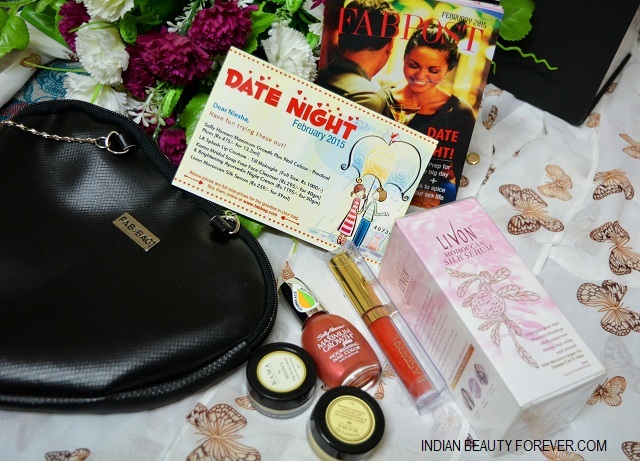 I had this same feeling when I got this Date Night February Fab Bag reached me. 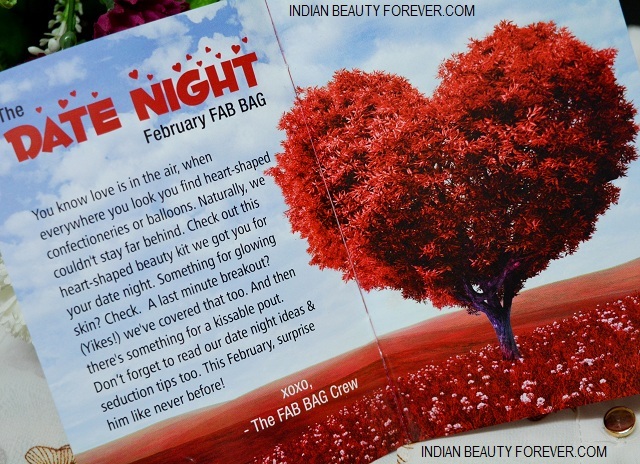 The cute leather like heart shaped pouch is carries the February goodies for us. I only wish the bag was red. I just love red but wait I got something else in Red to quench that red craving. What’s that? Let’s find out. 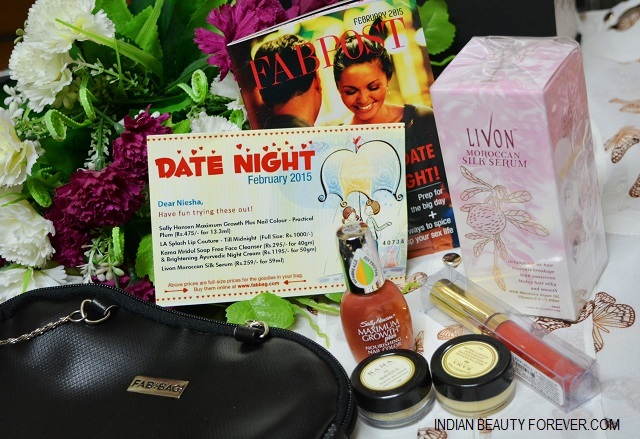 This month’s bag is a mix of various products which are much needed and can be quite useful. I love this serum and had already reviewed it. This is a good thing as back up. I got two samples from Kama Ayurveda Mridul face cleanser and Brightening Night cream. I have heard good things about this product so, trying them would be good as I can buy the full sized products then. I like Sally Hansen products after using a couple of their products earlier. It’s a corally shining color which will look fab if I wear sport this for the V day, most importantly it's a nourishing color for 475 Rupees. This is the red I was talking about, It a pretty reddish orangey color which I like. I have not used it, just swatched on the back of my hand and it was beautiful. Now along with the products, there was a mini magazine which you may know if you have seen the previous bags that I reviewed. It has good to know product information and some naughty and nice stuff like the one I have just captured for you girls.I hope the picture is big enough to allow you what's written over there. 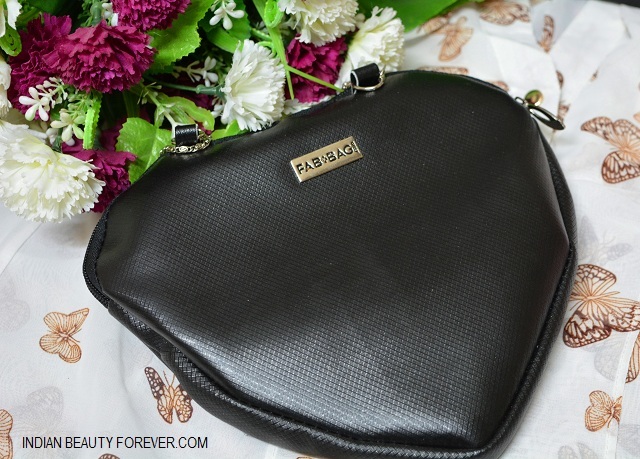 Fab Bag crew says “Surprise him like never before”. 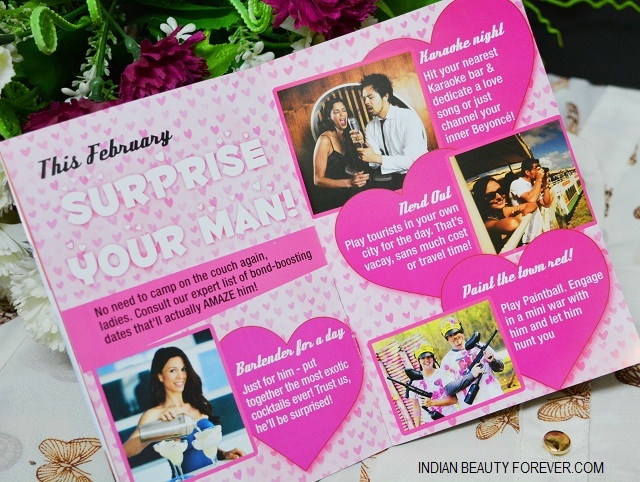 Yeah that a good idea after all it's Valentine, there should be something special and what better can that be to jazz up your appearnce and do that something extra for him.